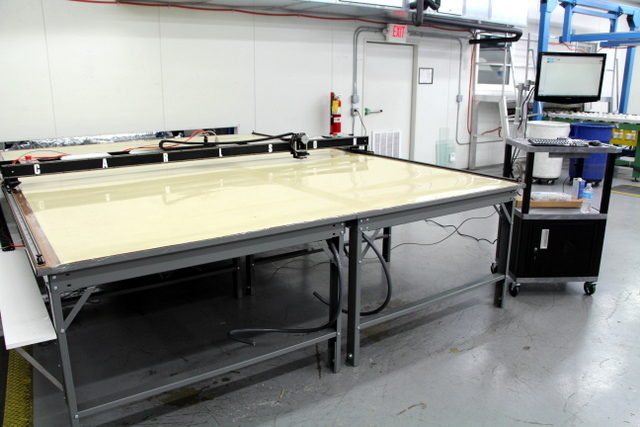 In November 2012, Carlson Design installed the PTi-108″ plotter/cutter at Oldcastle BE’s flagship glass plant in Los Angeles, CA. 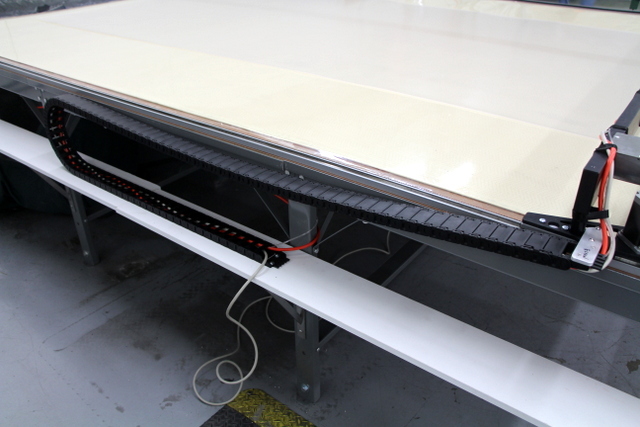 Cutting PVB and SGP in their glass lamination room, they hoped to use PMC’s nesting software “Lamimate” and our simple rolling and drag blade cutter to improve material yield and throughput. 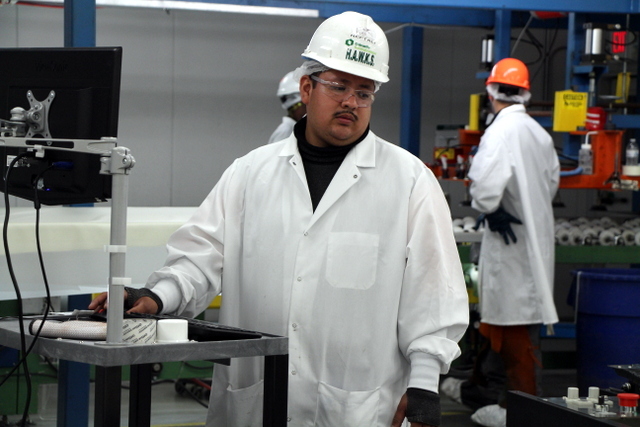 The result was a 25-30% increase in material savings, improved throughput, and cleaner layups. Automating the lamination room is a move plant manager, Todd Neufeld, called, “a no brainer.” This was a great installation and you can read more on this success story here. After six months of productive, waste reducing, and problem free cutting in LA — we were contacted by Paul Johnson, the CFM of Oldcastle BE’s Atlanta, GA glass plant. As their finance manager, Paul saw a clear opportunity in the numbers. They were spending, on average, $150,000 a month for laminate with a 60% yield. 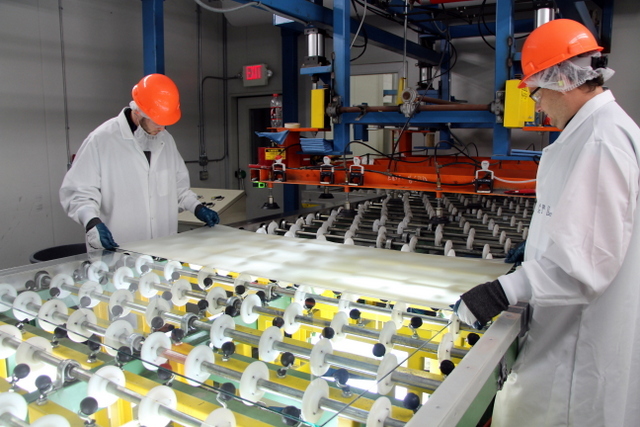 The Lamimate nesting package their production control/optimization software provider, PMC Software, was offering was promising 88-95% yields for their glass laminate. If they could achieve even a conservative 20% decrease in material usage it could save $30,000/month. That’s 2-3 month ROI!! Since Carlson Design was already an approved vendor and the software and equipment had been vetted by a sister plant, Paul was able to send a signed PO and deposit exactly two months after our first conversation. 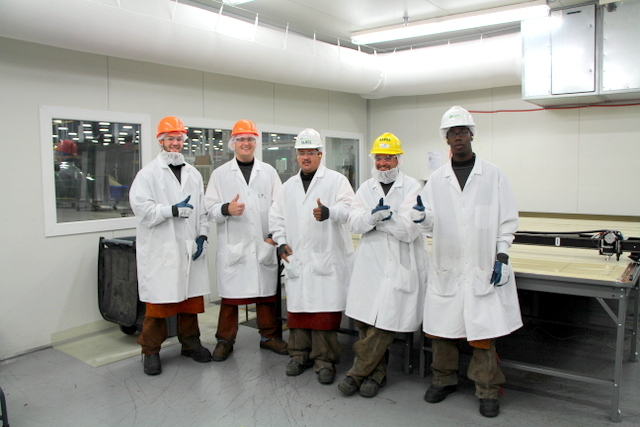 Oldcastle BE Atlanta lamination room team - Thumbs UP! July 2013. Saving 300k-400k per year is jaw dropping. To explain how this happens, let’s look at their current cutting process. Both LA and Atlanta plants originally used an automatic roll fed slitter/sheeter. Based on a job ticket listing glass about to come through the washer, they would loaded material into the feeder that most closely matched the width of the most popular dimension in the order. A quick example — If the ticket shows 47″x50″, use 48″ wide material. If the ticket shows any larger pieces, say 50″x50″, they can’t use 48″ wide material and instead must use 60″ or 72″ wide material. The operator tries to cut the laminate to roll width and oversize the length by 3" in each direction. If the cut is too small, the entire sheet will get thrown out. It can be difficult to oversize cuts consistently and rarely do you see cut oversized by only 6". 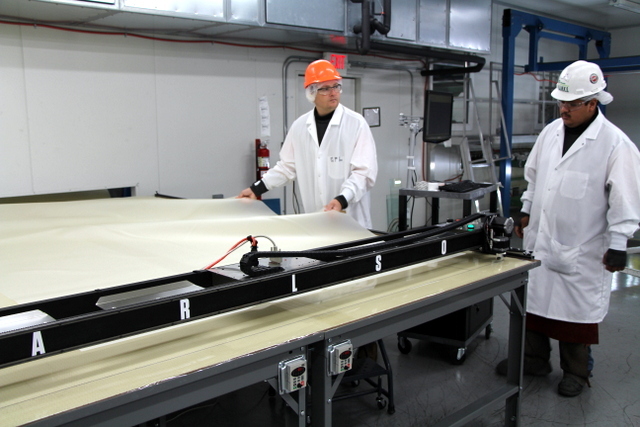 The lamination room operators are tasked to complete all jobs given to them each day. Their number one priority is throughput. 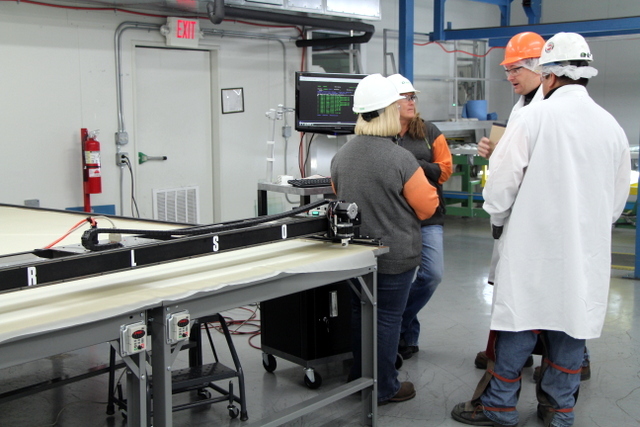 This means, as production backs up, the lamination crew will always favor speed over waste reduction. When you are “in the weeds”, asking for an extra person to help cut seems more expensive than throwing out a little extra scrap. That “scrap”, however, costs an additional $1000-$1500 per day. Material size is controlled by the operator. 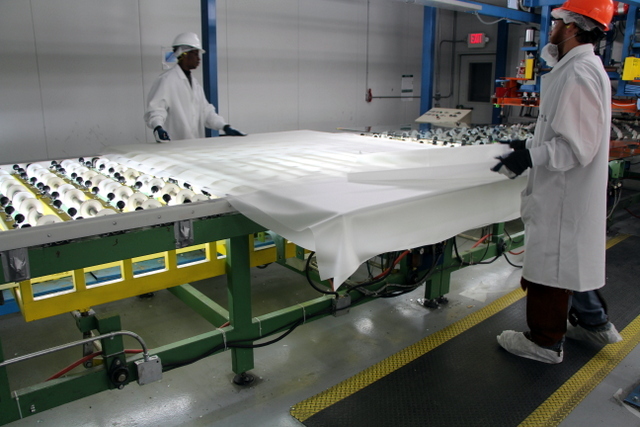 As production becomes more demanding, sheet size grows and grows. This all must be manually trimmed. Before we installed the Carlson Cutter, we made two quick videos of manual spreading and manual trimming. All oversized cuts must be trimmed before the glass is pushed through the nip roller. With the Carlson system and PMC’s Lamimate software, the operator uses the job ticket number to nest all parts for an upcoming order. The software uses roll width inventory, the number of desired material layers, and the number of parts to cut to automatically determine how many “pulls” or “tables” to cut off each roll width. An illustrative example — the operator is instructed to cut file names “abc”, “efg”, and “hij” out of 72″ wide material — then cut file names “xyz”, “qrs”, “tuv” out of 48″ wide material. 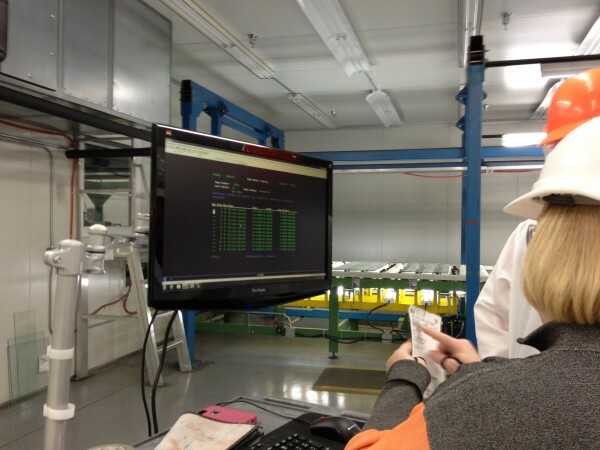 The computer looks ahead to determine optimal combinations — now increased production volume cannot sacrifice material efficiency. 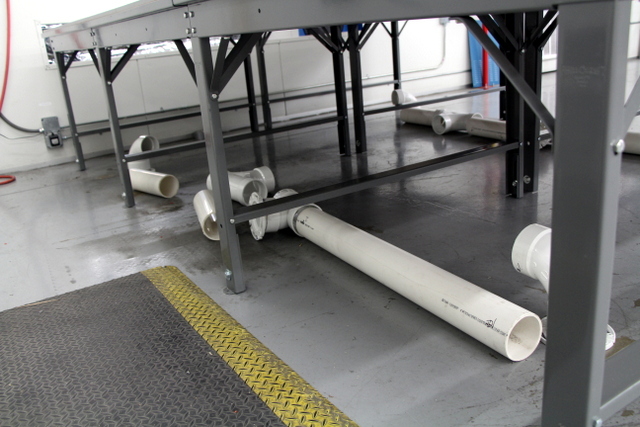 PMC nests parts across all available roll widths, informing the operator how many "tables" to pull for each. Brooke -- Oldcastle's PMC power user -- explains how to select each table. 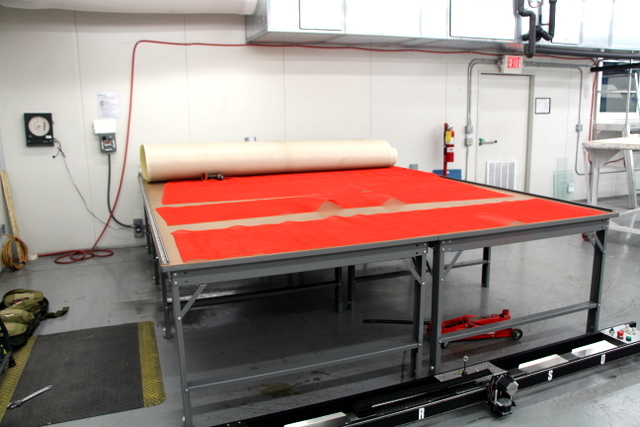 Even cutting simple jobs, like 12″x12″ samples, will see significant time and material savings. 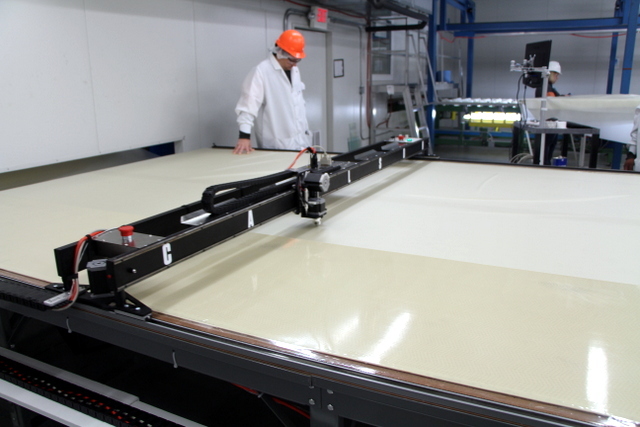 To make 60, 12″x12″ rectangles on 72″ wide material the operator used the Carlson Design rectangle maker to input Length (12″), Width (12″), Rows (6), and Columns (10). 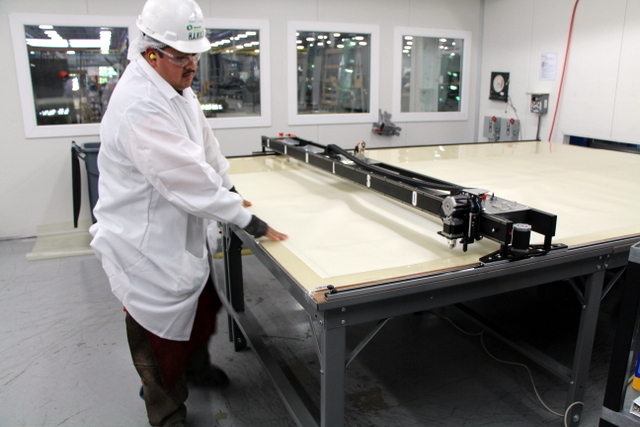 The material yield on a 72″x120″ was 100% and cut time only 2 minutes. To make the same cut by hand, the operator must oversize each 12″x12″ square by 3″ in each direction. A job that took 60sqft using the Carlson cutter requires 135sqft when cut by hand — at 0.70/sqft that’s over $50 in waste from a single sample run. qty 60, 12"x12" rectangles cut in 2 minutes with zero waste. 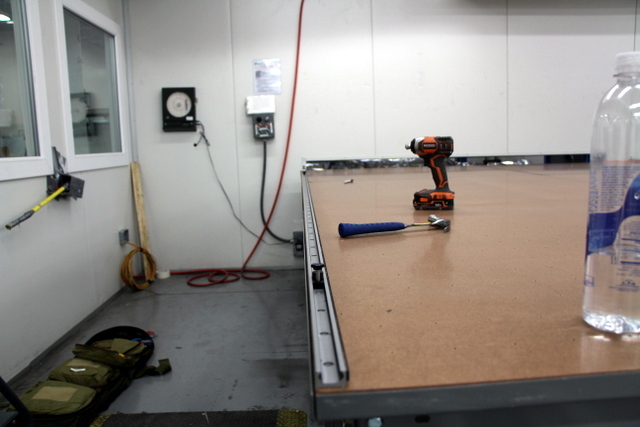 In production, cross cutting panels oversized by 3″ on each side doesn’t seem like a lot, but it adds up quickly. 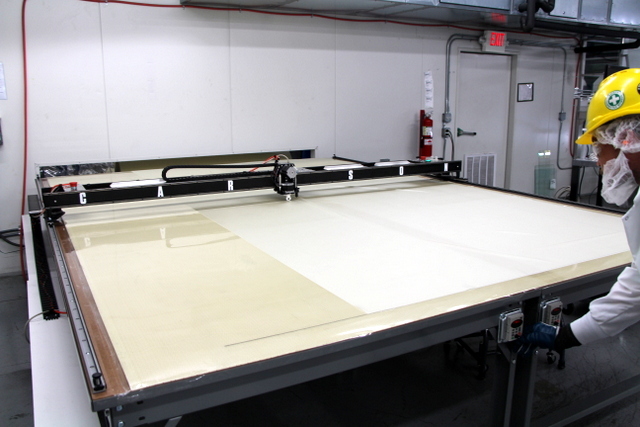 During our first training day at OCBE ATL we cut qty48, 63.375″x70″ panels. The old technique would have called for a 72″ wide roll cross cut at 69-70″ in length — this oversizes the 63.375″ dimension by 3″ on each side. That results in 144 sqft of waste (qty48 * 6″x6′ waste per lite). Using the Carlson cutter, they can still cross cut 72″ goods for speed and efficiency, but there’s no need to oversize the cut by 6″. Cross cutting to exact width plus ~1/2" to account for shrinkage. Parts layup and stack faster when cut to size. Depending on the environment, some layups are slightly oversized to prevent shrinkage. Set this appropriately and then enjoy the time saved by eliminating post trimming. For smaller parts, the Carlson cutter saves even more time and material. 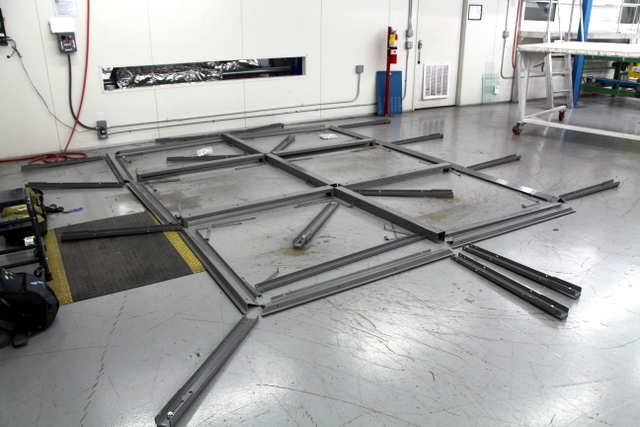 One job cut during training called for qty 96, 25″x65″ panels — PMC’s software nested four of these panels on a single table and instructed the operator to pull 72″ wide material. Each table took less than 50 seconds to cut and saved 12 sqft in waste. 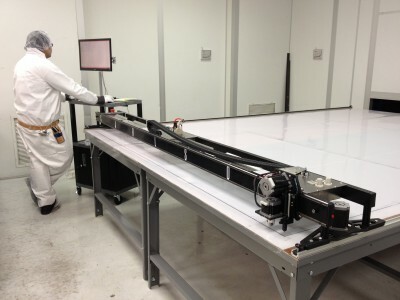 For 45 minutes of cutting the operator will save 288sqft, which is over $200 @ $0.70 per sqft. The increased precision also makes layering easier, eliminates post trimming, and helps turn the job of cutting into an entry level position. 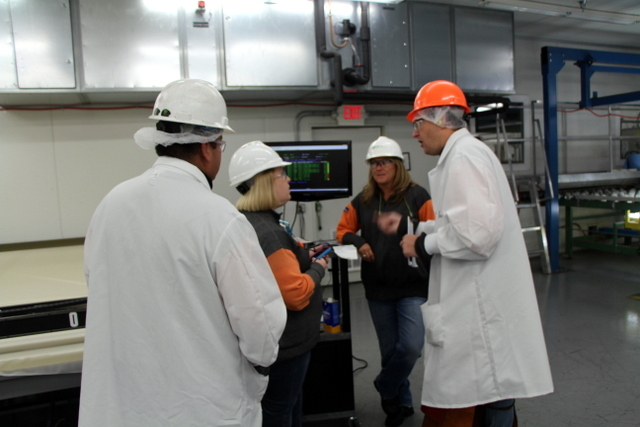 With minimal training, the operator can maximize material savings, without reducing throughput. And reduced throughput is always the first objection. “This will never keep up”. However, after a few hours of eliminating mental calculations, measuring, and trimming it’s apparent the plotter/cutter is going to be a time saving addition to any clean room. Here’s a video taken on the second day of training: https://vimeo.com/70197702 – cycle-to-cycle to cut the four panels mentioned above is less than two minutes. CHANGE!!! Initial objections are overcome through seamless integration. Nef running the plotter/cutter on the second day. 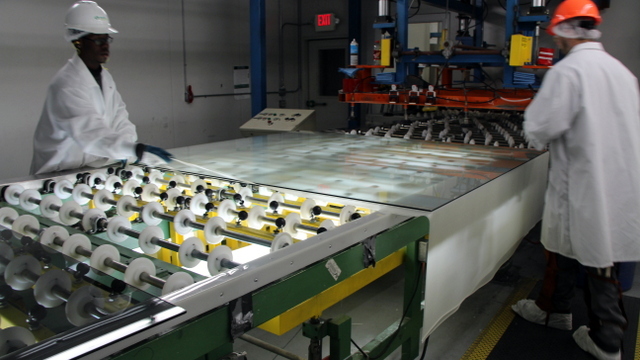 It’s unheard of for any large glass plant to cut glass on the production line by hand. Glass is a commodity and without nesting to save material it would be almost impossible to price product competitively. Despite this fact and the fact that laminate is two to five times more expensive than glass, most lamination rooms do not nest their laminate before cutting. To introduce nesting into your laminate room, there are several options. 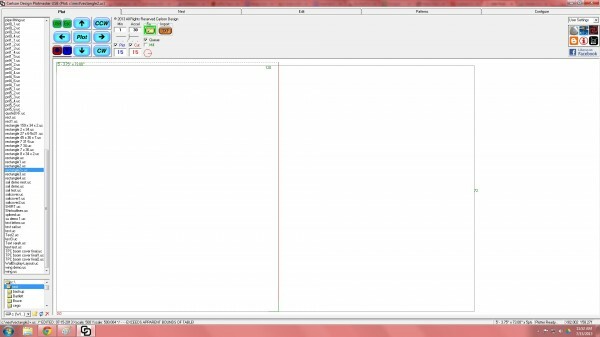 If you are Oldcastle BE or a customer of PMC Software then you can use PMC’s lamimate software, which will connect with your existing production schedule and nest parts across your inventoried laminate roll widths. For ease of integration, continuity, and efficiency this is a great option. PMC does an excellent job of getting material yield percentages in the high 80’s and 90’s. 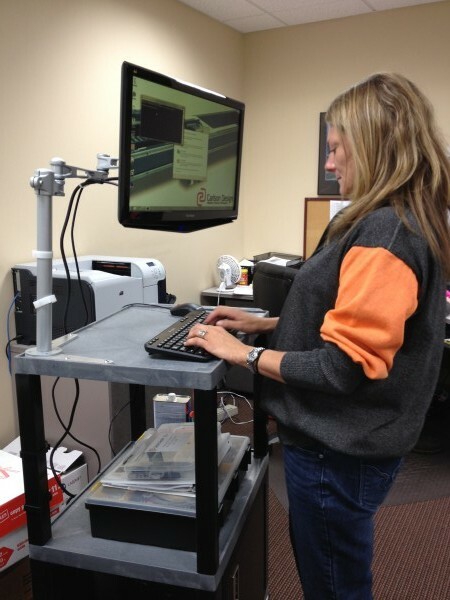 Heather loads PMC software on Carlson Design's mobile workstation. We wheeled this from the lamination room back to the front office. To integrate nesting without PMC, Carlson design offers several solutions built directly into our software suite. 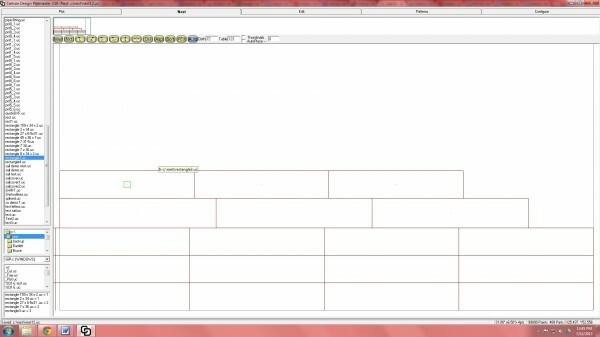 A rectangle generator and manual nesting program is included with our controlling software, Plotmaster. These programs are so simple to use, that we started training in Atlanta and LA with just the rectangle maker while PMC was still installing. Instead of using rack numbers, this operates just-in-time, with the operator creating and cutting glass shapes as the glass comes into the room from the washer. This simple process saves time and material. Nesting rectangles manually is easy and intuitive. You can also nest shapes. We also offer an automatic nesting program called Nestfab. Nestfab can automatically layout patterns across multiple tables. We can handle a variety of file formats ( like *.DXF and HPGL) and even work with you for custom file imports. Carlson Design plotter/cutter hardware and software is very intuitive and easy to learn. We establish one or two primary operator’s and train them how to run and maintain the system. We do this by cutting real production work day one and then have the operator’s teach someone else to operate the system day 2, solidifying their knowledge. If you are working with PMC they have a similar system. They train a “Power User” who intern trains the guys in the lamination room. Heather from PMC training Brooke. 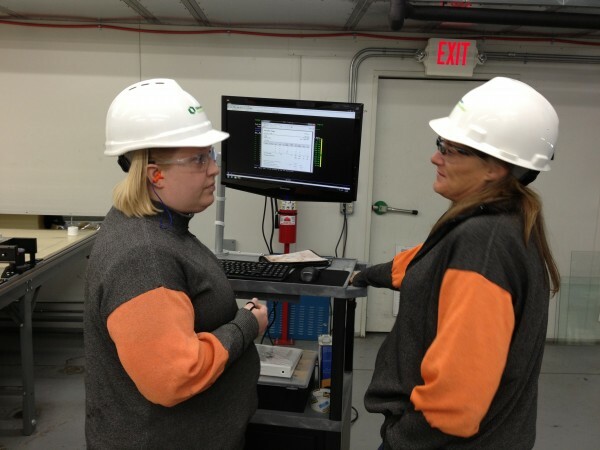 Brooke is Oldcastle's "power user"
Heather trains Brooke, Brooke trains the team leader in the Lamination room. 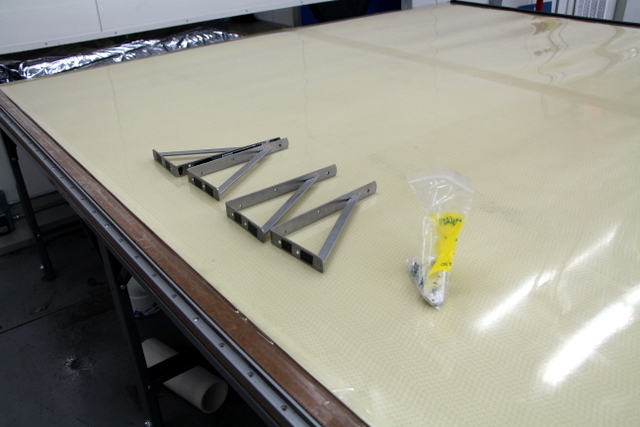 Our plotter/cutter hardware is very simple and lightweight. This makes it relatively maintenance free and easy to service. We provide a spare parts kit that has all of the tools and parts to diagnose and service virtually any problem with the machine, in-house. During the installation, we establish procedures with the maintenance department for a maintenance schedule and how to place service calls. The plotter/cutter has two main consumables – blades and cutting surface. There are two types of blades — rolling and drag. Both can be purchase online. Average consumption for rolling blades is 100-200 blades per year (@ $2/blade). Cutting surface, depending on type and cut volume, will last anywhere from 6 months to two years. It is secured to the table by packing tape, which makes it quick and easy to replace. On recommendation from Oldcastle LA, Oldcastle Atlanta decided to switch from 1/16″ polyethylene sheets to a continuous micro-performated cutting surface. The micro-perforated surface is significantly more expensive, but does not have any seams or holes that could cause a partial cut. Before ordering, Paul Johnson checked with OCBE LA for any other suggested changes to the system. In addition to recommending continuous-sheet-cutting-surface they recommended increasing the number of vacuum blowers, adding easier on/off vacuum switches, and switching from a composite to a steel track system to prevent wheel wear from contaminating the layup. We loved the idea of creating the “ultimate lamination cutter” and ran with the feedback. 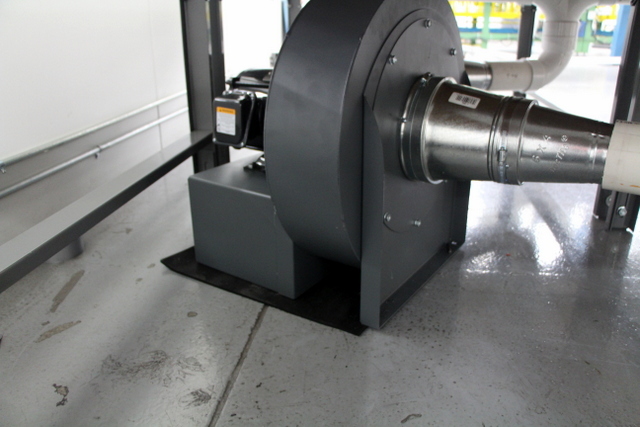 For the vacuum blowers, we increased from a single 1.5HP radial blower to two 5HP radial blowers. 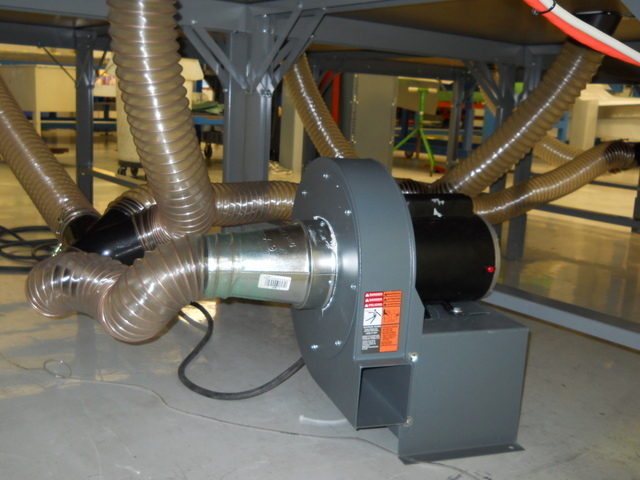 Oldcastle BE Atlanta's Two 5HP radial vacuum blowers ensure the material isn't going anywhere during cutting. To improve vacuum on/off time, we provided two programmable variable frequency drives (VFDs) with remote on/off switches mounted at the center of the table. These let us set blower ramp up and down speeds to 5 seconds and 10 seconds respectively — much faster than only using an on/off switch. VFD's turn the blowers on and off much faster than a traditional switch. They are also helpful in environments with a limited power budget. 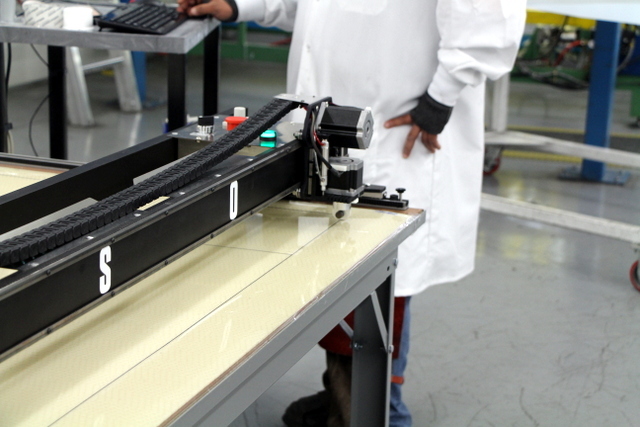 Specially made continuous steel track system ships in two long sticks. This track is very fast and will essentially last forever. Bryan Staight, the finance manager from Oldcastle LA concluded his feedback with, “Other than that, it seems to work as advertised”. We advertised it works great! Our plotter/cutters have two tools — a pen and a cutter. 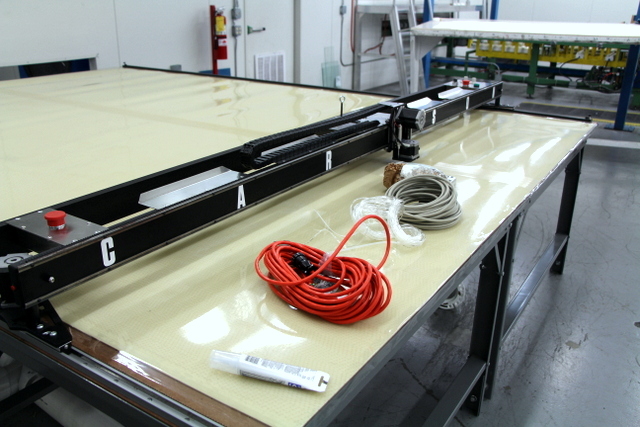 In the lamination room, the pen is primarily used for calibrating the machine and setting the user home. “Home” or (0,0) is always relative to the pen, but is typically set in the lower left or lower right hand corner of the table. This is where you will start each cut. Home -- the cutter will return here before starting the next cut. 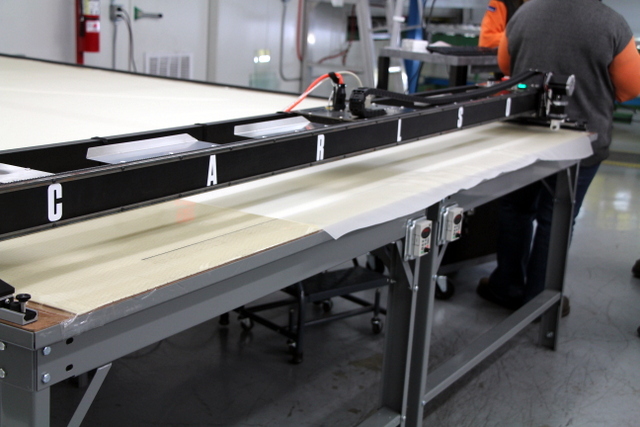 Before cutting, the operator spreads the laminate across the table. 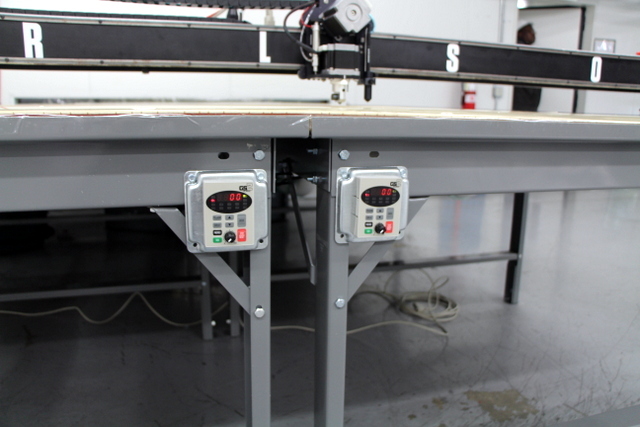 An alignment mark on one edge of the table helps the operator keep the fabric roll straight. Material must be spread by hand. Turn the vacuum on before each cut and off to remove material. You do not have to wait for the last cut to finish to turn off the blower. For simple cross cuts the blower may not even be needed. When ready, hit the "Plot" button on the screen or the "hot key" on your keyboard to start cutting. We suggest using different blades for different materials. 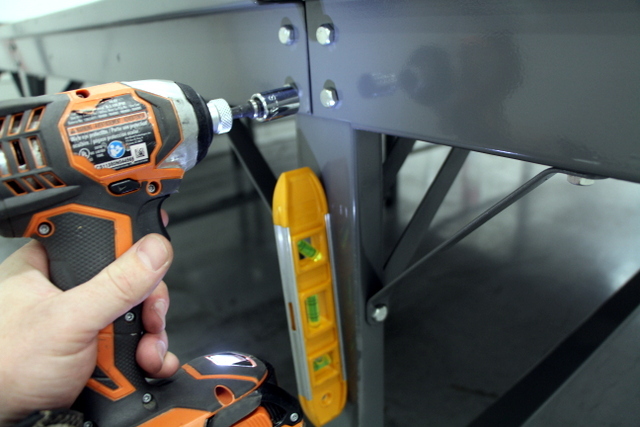 Our blade holders magnetically mount, so it’s easy to swap blade holders without using any tooling. .050″ SGP – 28mm or carbide drag blade holder. Depth and pressure set by user. Material may not cut all the way though and instead “peel out”. .090″ SGP – carbide drag blade with blade set shallow. Pressue 22psi. Must be able to access one edge to fold and “break out” part. Peels out along score and fold. 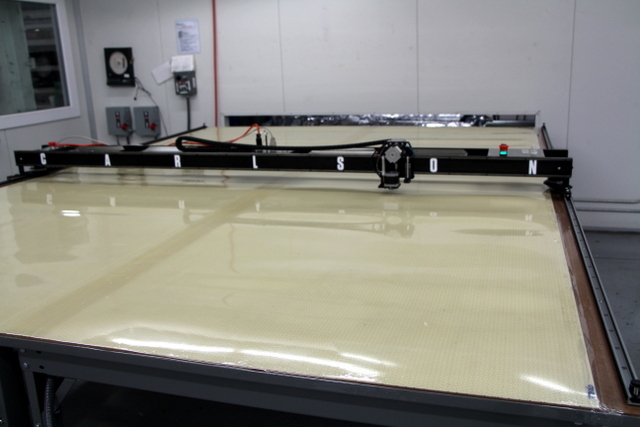 We offer a lot of user features specifically for the glass industry. Many of these were developed with feed back from our lamination customers. One feature — called “parking” — sends the cutter to a designated location at the end of a plot/cut. This places or “parks” the machine out of the operator’s way while unloading and loading the next table. Another feature — cut roll off — automatically makes a clean cut at the end of the pattern so the operator can advance the next run without trimming away waste. Our software allows the users to preset different speeds and configuration settings for different materials. These automatically change when a material type is selected. They set parking 30" from the start. This is an easy value to change and can be modified to user preference. 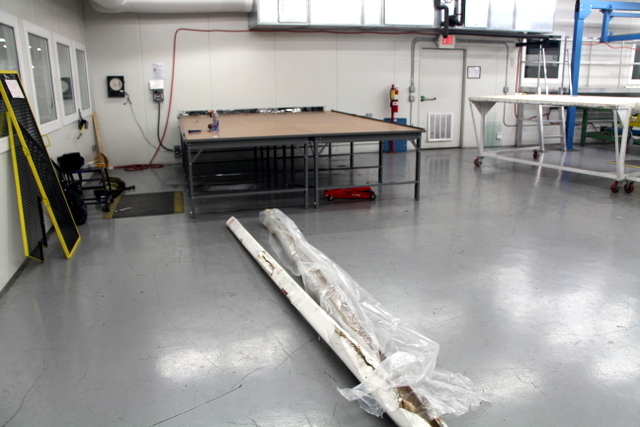 *The day before we arrive clear the area in your clean room where you plan to mount the new cutter. This means removing any tables, slitters, or carts. 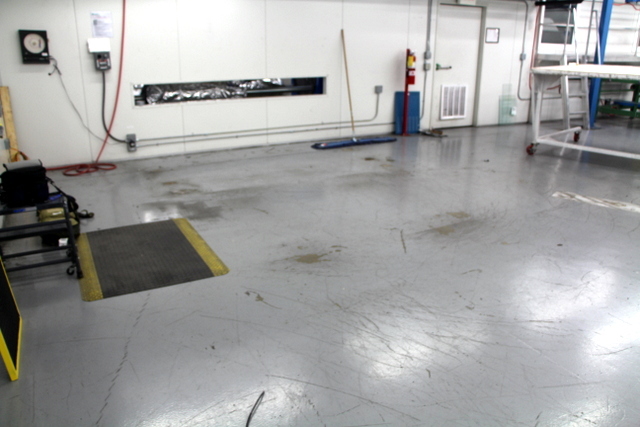 *Use the day of the install as an opportunity to clean the clean room. This does not have to be a lost day. 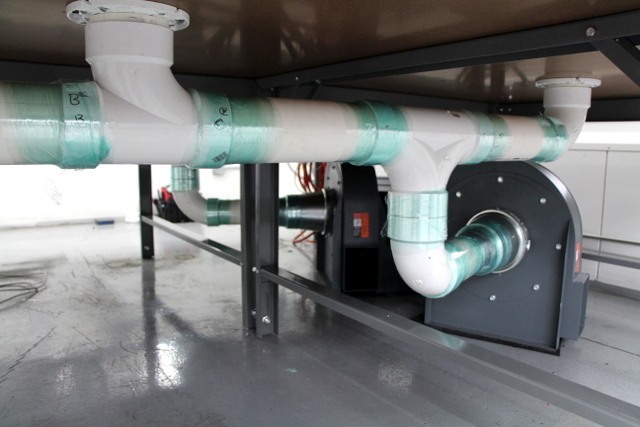 *Contact an electrician and have them plan to wire the vacuum blowers by noon on the first day of the install. *Have PMC arrive day one of the install to begin installing their software on your system and ours. 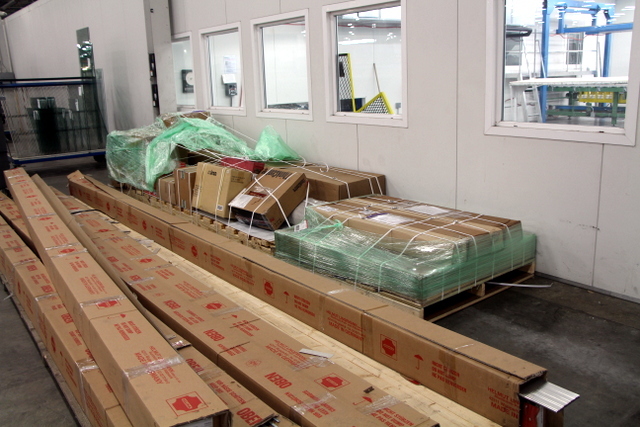 The plotter/cutter and table arrive on separate pallets. It's a good idea to un-shrink wrap and look for any obvious shipping damage. Begin with an empty clean room. It's a good idea to sweep the area and remove any debris before we arrive. Layout the table. This makes assembly much faster. 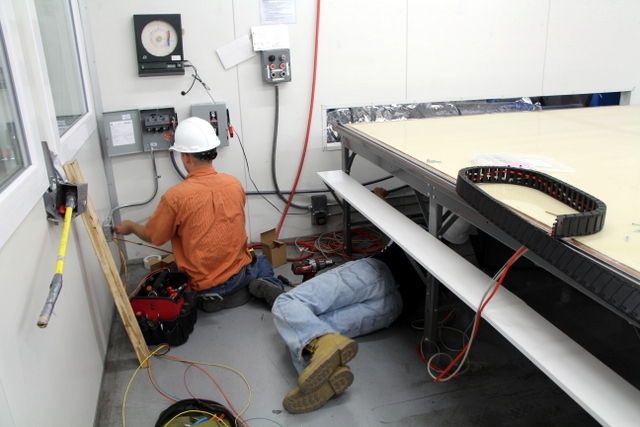 Providing a "helper" for 1-2 hours will ensure the installation is completed on the first day. 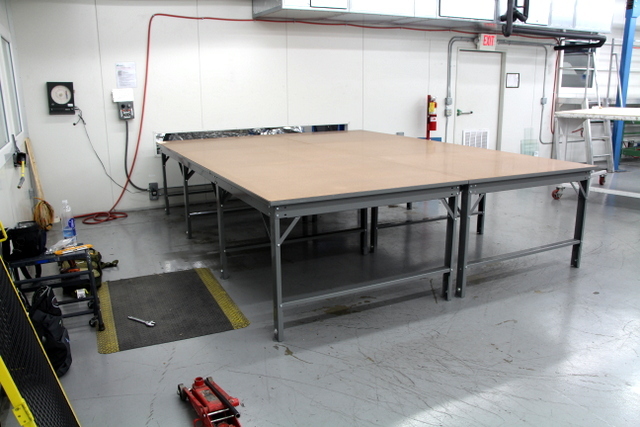 The table is assembled in sections using many 1/2" nuts and bolts. 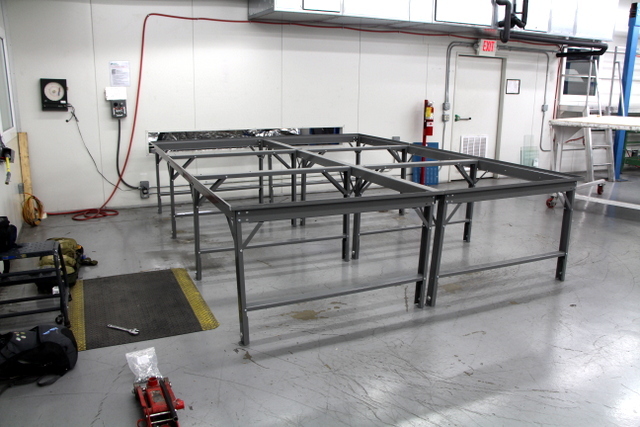 When the frame is assembled it's time to decide exactly where it's going. Oldcastle Atlanta positioned there's centered on their lami slot, 1' from the wall. This allows someone to still walk across the back side of the table. Insert table tops. These are "pre-sucked" at our factory to remove any debris inside. 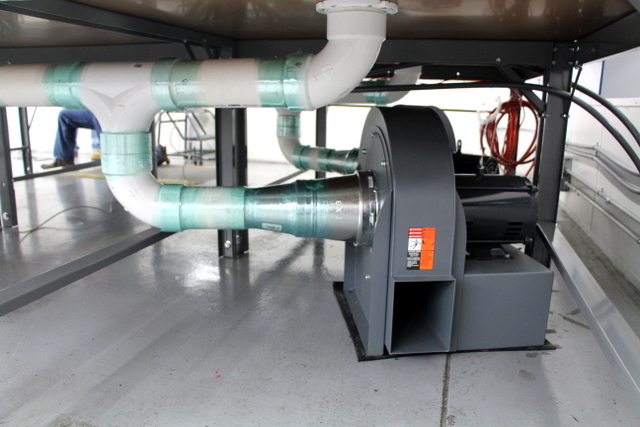 Filters on the blower exhaust further reduce any particles from blowing around the room. Square the frame and tighten the all nuts and bolts. Level the frame. Please provide a floor or bottle jack to assist with leveling. Install continuous track side A. The plotter/cutter is used as a jig to square side B. Cover the table with our vacuum breather mesh. 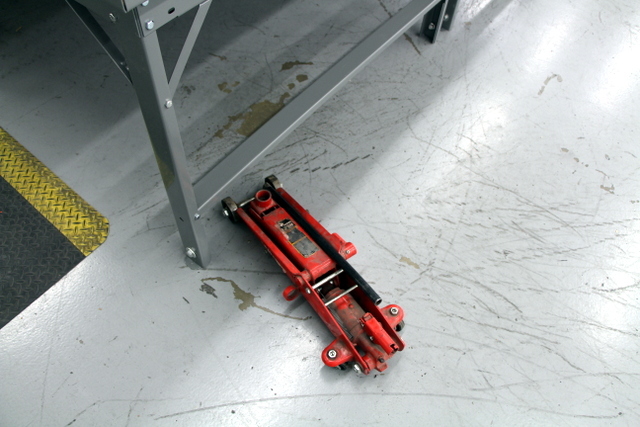 This creates an air-channel between the table and the cutting surface. Add the cutting surface. Secure to the table with packing tape. The material will sit under it's own weight -- the tape is to prevent vacuum leaks. Attach blowers. This should occur around noon the first day. Once you know where the blowers will be located, the electrician can begin wiring. Wrap all plumbing connections with stretch wrap to eliminate any leaks. 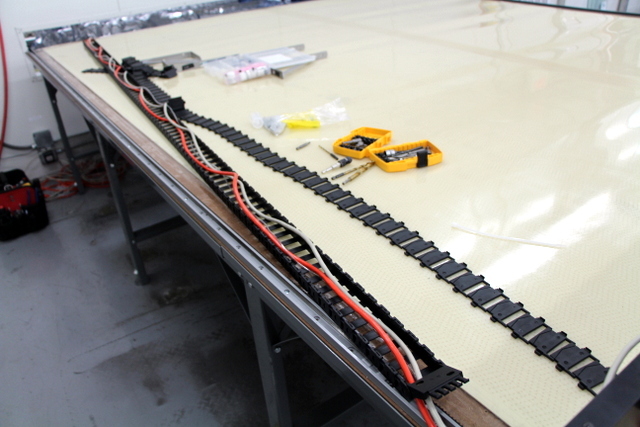 Unzipper Echain and run plotter/cutter control, power, and air cable. VFD's conveniently mounted at the center of the table. 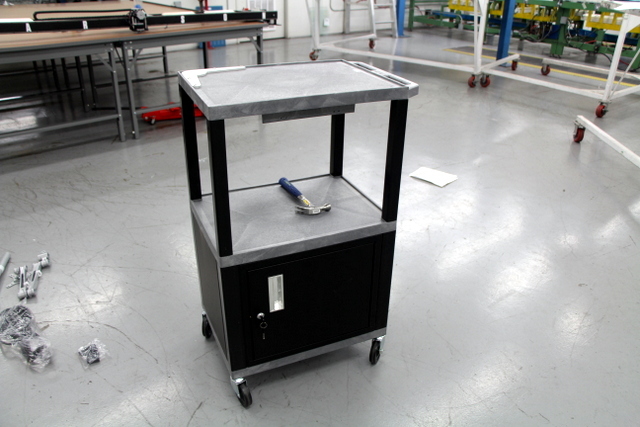 Assemble computer cart. Lockable box great for storing tool kit and documentation. Finished install! Waiting on the VFD's to be wired. Let the training begin in the morning. The start-to-finish process for purchasing a Carlson Design plotter/cutter system is simple and straight forward. Step 1: Contact Carlson Design for a custom quote. 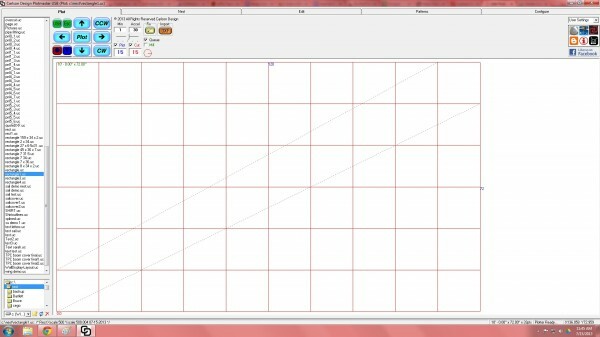 Let us know of your widest material width and patterning software (if you are using PMC, you will also want to contact PMC). Step 2: Start your order by signing your proforma and sending a deposit. Lead time is typically six to eight weeks. Step 3: Make final payment, shipping, and installation schedule arrangements. Step 4: The day before the install clear the room. Make an appointment with the electrician for the following day at noon. Install Day 1: Install system. Have PMC load their software on the plotter PC. Have the electricians wire the blowers. Install Day 2: Train power user for PMC. Train power user on plotter/cutter. Review maintenance procedure. Install Day 3: Power user trains team. Cut real production all day long. We would like to give a big thank you to Joe and Kenny in the maintenance department. To Heather from PMC and OC’s power user Brooke. To Chris, Nef, and Derrick running the Lami room. To Jeremy the production manager for keeping everything moving. And finally Paul Johnson for seeing the opportunity and moving forward. This is a great application for our equipment. If you have a glass lamination room and are looking to automate, please do not hesitate to contact us with any questions.